In accordance with the National Policy of Education (1986), Govt. of India started Jawahar Navodaya Vidyalayas (JNVs) all over the country except the state of Tamil Nadu. 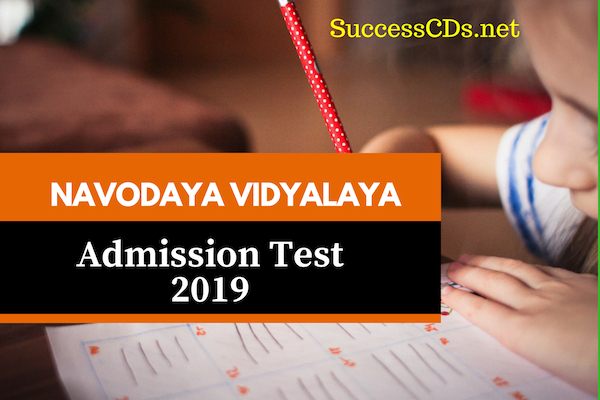 Though admission to Navodaya Vidyalayas is at Class VI level, in order to optimally utilize infrastructure facilities available, vacant seats at Class IX level are filled through an All India level Admission Test (Navodaya Entrance Exam). Students belonging to SC/ST categories, Girl students and the students whose family income is below poverty line (BPL) are exempted. To provide good quality modern education including a strong component of culture, inculcation of values, awareness of the environment, adventure activities and physical education to the talented children from rural areas without regard to their family?s socio-economic condition. Jawahar Navodaya Vidyalaya : At present, there are 630 functional Jawahar Navodaya Vidyalayas spread over 28 States and 07 UTs. In order to optimally utilize the infrastructure and other facilities available in these Vidyalayas, it has been decided by the Samiti to fill the vacant seats in Class IX through an All India level Admission Test. The time of duration 2? hours (10:00 AM to 12:30 PM). However, in respect of candidates with special needs (Divyang), additional time of 30 minutes will be provided, subject to the production of certificates from the competent authority. Centre for Exam Shall be the JAWAHAR NAVODAYA VIDYALAYA of the district concerned/ any other center allotted by NVS. If there is any change, the same will be indicated in the admit card. The test will be of objective type with 2 ? hours duration without any break. The existing vacant seats in the SC/ST category as notified are reserved for the SC/ST students. For vacancy position, website of NVS(HQ) may be referred. Duly filled in application forms must be sent through registered post A/D. If the candidate prefers to submit Application Form in person, he/she is advised to get the acknowledgement from the office of the Principal of Jawahar Navodaya Vidyalaya. Result of the Selection Test may be ascertained from the application portal of NVS through which application is submitted. Result will be notified in the Vidyalaya Notice Board as well as published in the website of JNVs concerned. Selected candidates will also be intimidated by Speed post and SMS.